Hello Friends! 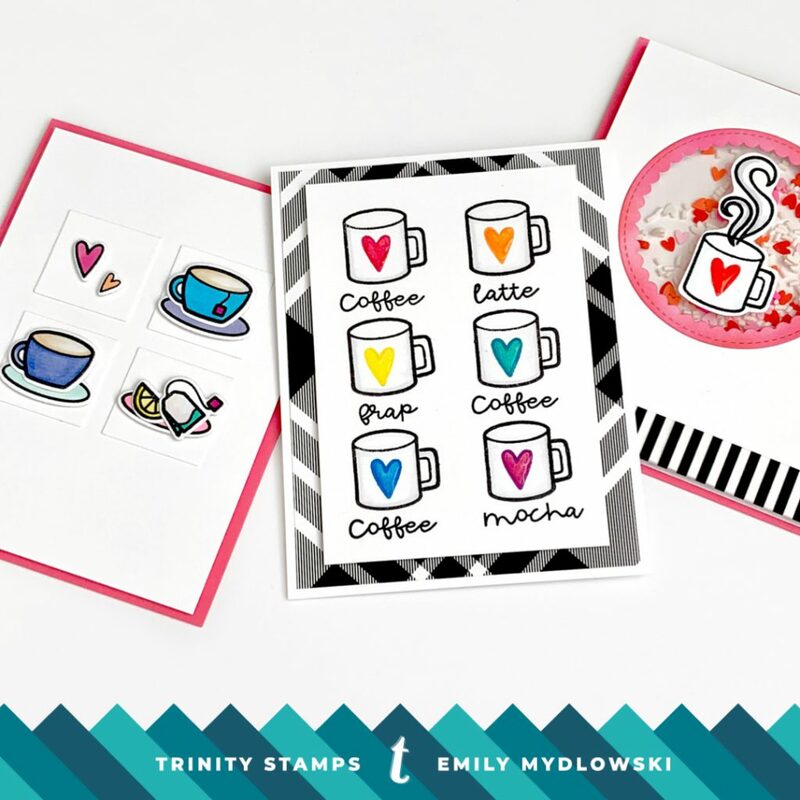 Happy Monday and welcome to this month’s One Stamp Three Ways post. 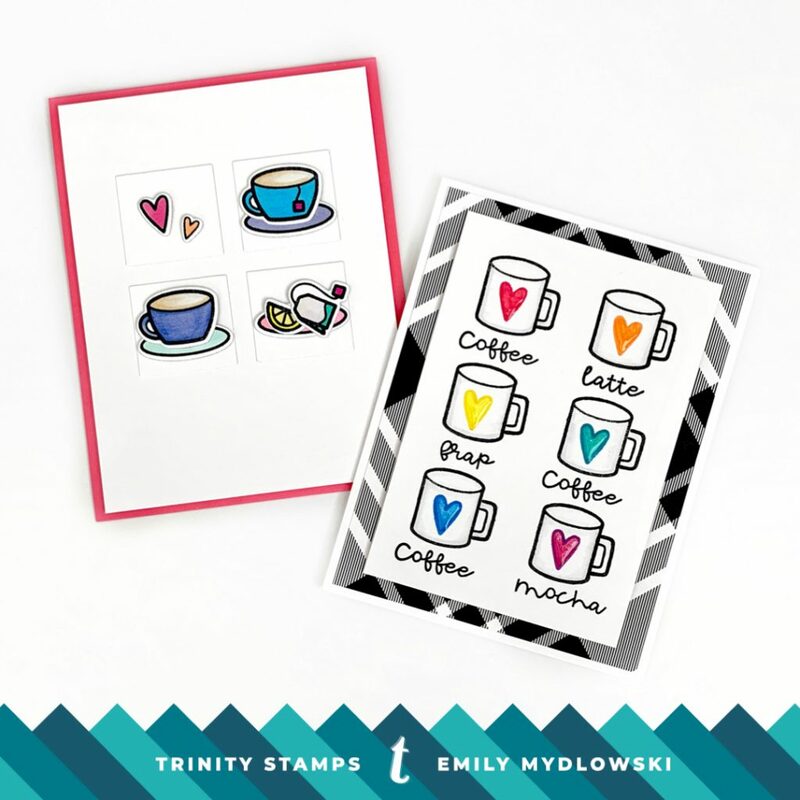 I’m sharing three colorful and heart-inspired Coffee & Tea cards using the fun image-filled Coffee with Character stamp set and matching dies. 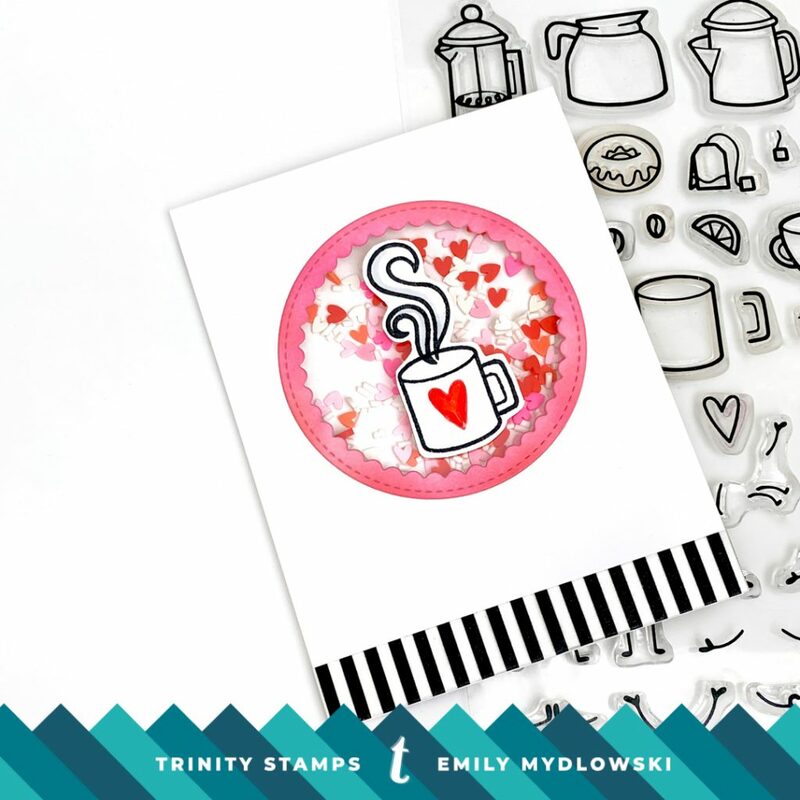 This stamp set is HUGE and has so many fun coffee and tea images to play with. I’m both a coffee and tea lover and so happy that both are represented in this stamp set. I start my day with a cup of coffee (well, maybe two) in the morning and then a nice relaxing cup of tea in the evening. I also love the little heart images in this set because of their playful shape so I wanted her to be present in all three cards. For both of these cards, I used a six square panel die that I had in my stash as a template for both of the cards and then I used the negative square pieces on the “I Heart Tea” Card. I placed the square template on a white card base and traced the six squares lightly with a pencil. I removed the template, and then stamped six coffee cups in each square and then added their handles. I then stamped the heart in the center of the coffee cup with a rainbow color VersaFine Clair Ink. This is my favorite Clair Ink Rainbow Combination: Glamorous, Summertime, Cheerful, Warm Breeze, Paradise and Purple Delight. To color the hearts, I “matched” up the ink color with some colored pencils and and used a blending pen to blend the colors. After coloring, I covered the hearts with glossy accents for some additional pop. Then I added a piece of patterned paper to a white card base and adhered the stamped card panel with foam tape. Using the the square template as a guide, I glued four squares to the top center of a white card stock panel. Then I stamped, Copic Colored and die cut several images from Coffee with Character. I tried to make sure that the images had a color of the rainbow. I adhered a colorful plate to three of the squares and then set each of the plates with different tea party die cut elements. 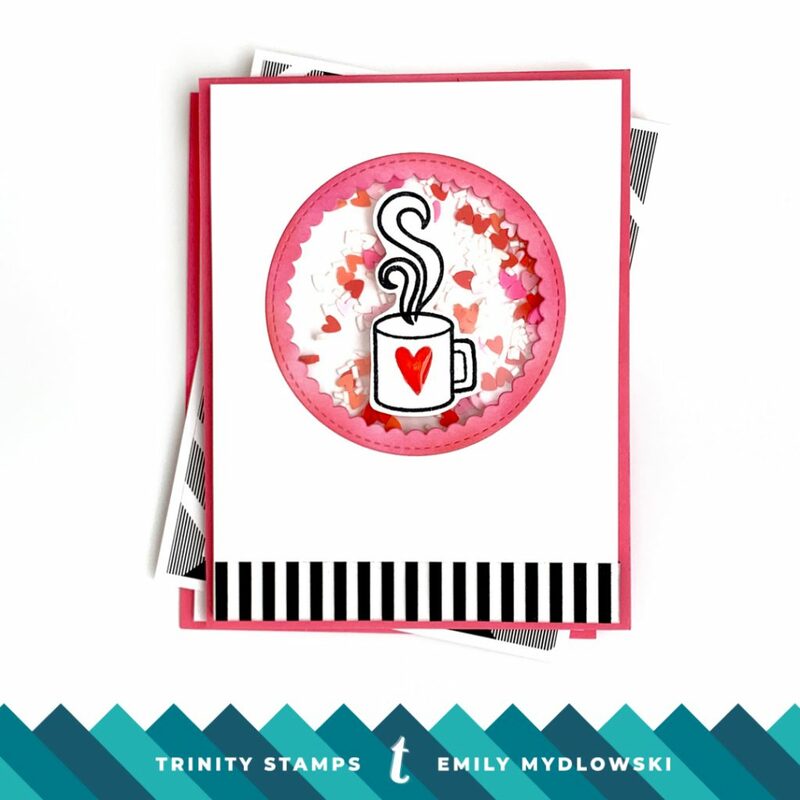 I love that you can add that little tea bag string to hang over any of the cup images…there are so many little stamping details like this in this set! Then I finished the card by adding two little hearts on the top left square and adhered the card panel to a pink card base. 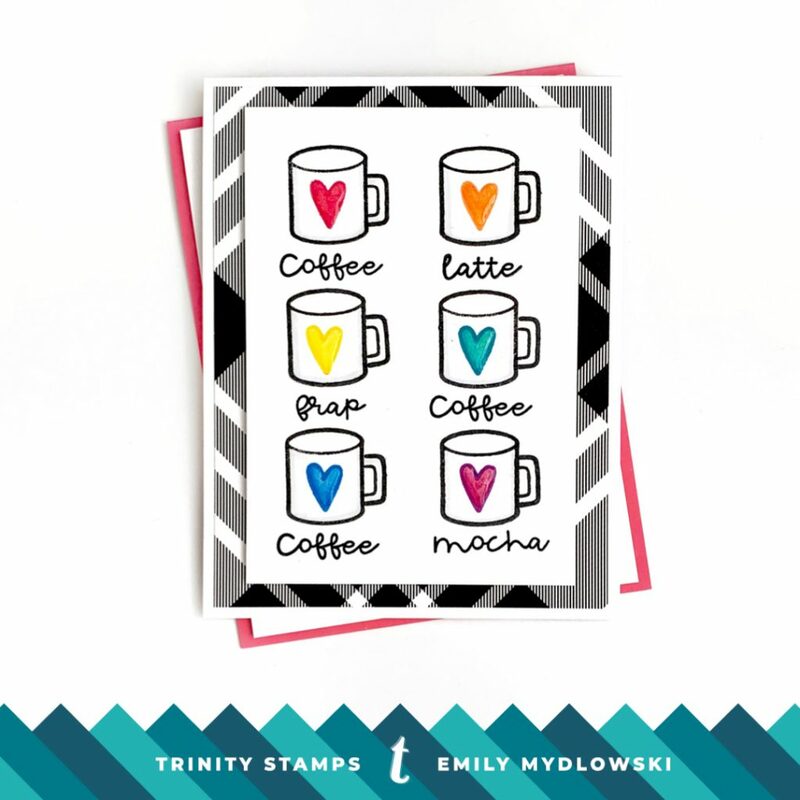 Who doesn’t love a fun coffee love shaker card! I realize after making this card, it would make for a perfect Valentine’s Card…so I’m now a year ahead schedule…LOL!! There are so many great “How to Create a Shaker Card” video and posts out there. I’ve learned there are three basic elements: (1) Create a Window with Acetate (2) Create a Shaker Element Barrier around the shaker window with double-layered foam tape (3) Add LOTS of Shaker elements [I used Sweet & Tart Heart Sprinkles and Creamy Vanilla Sprinkles) to your card base/panel and then bring your Foam-taped/barrier shaker window panel to your shaker elements. 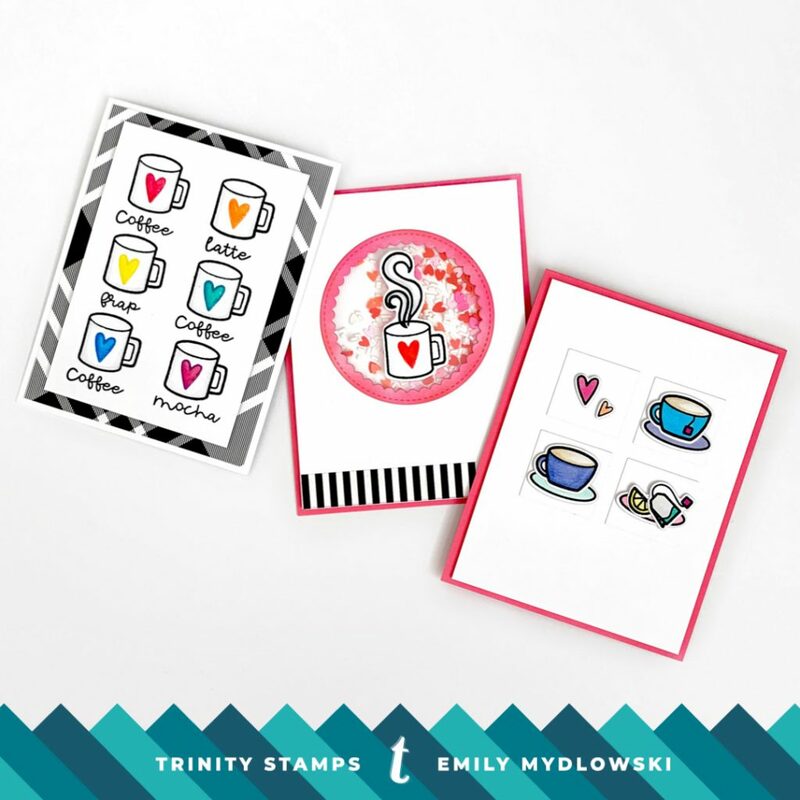 So there we are friends, three bright and cheerful Coffee & Tea Loving Cards using the Coffee with Character stamp set. I hope you enjoyed these projects and it inspires you to create some CAS style yummy drink cards. 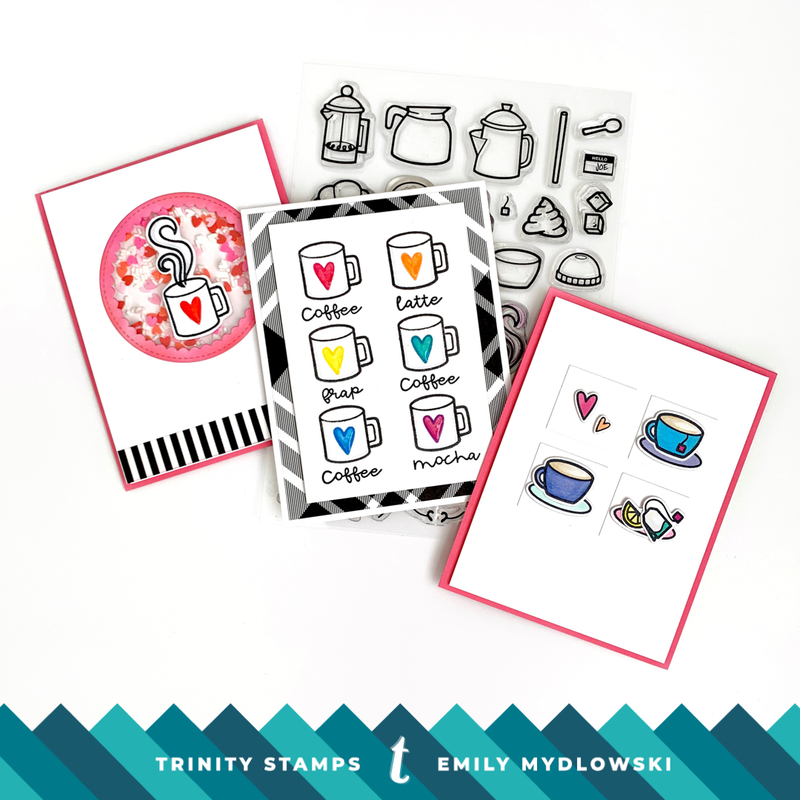 Remember to check out/subscribe/follow the Trinity Stamps Blog, You Tube Channel and Instagram feed for more design team inspiration all week long. 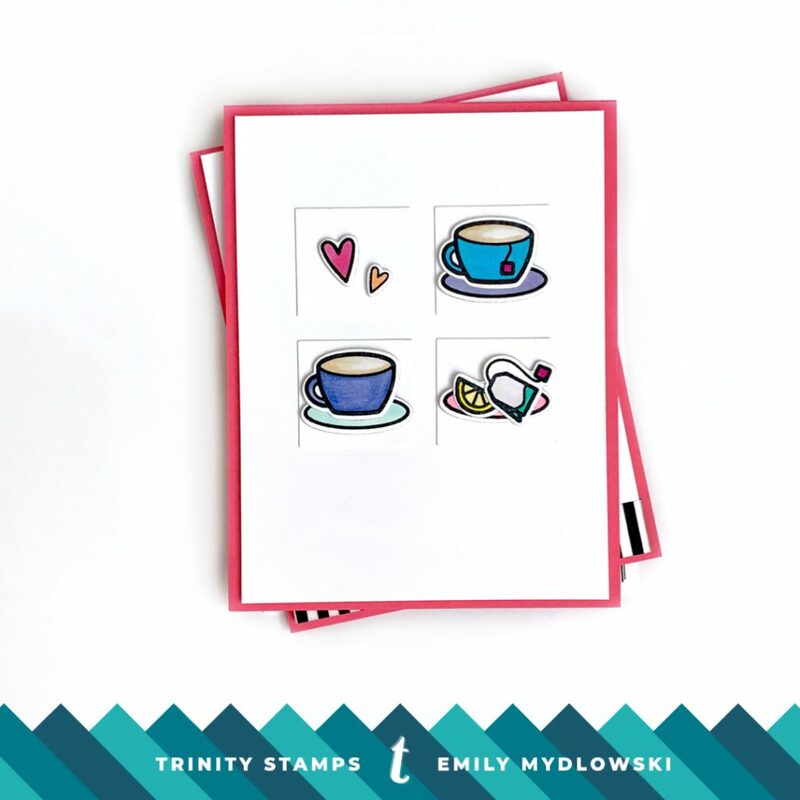 We always love to see your Trinity Stamps creations. 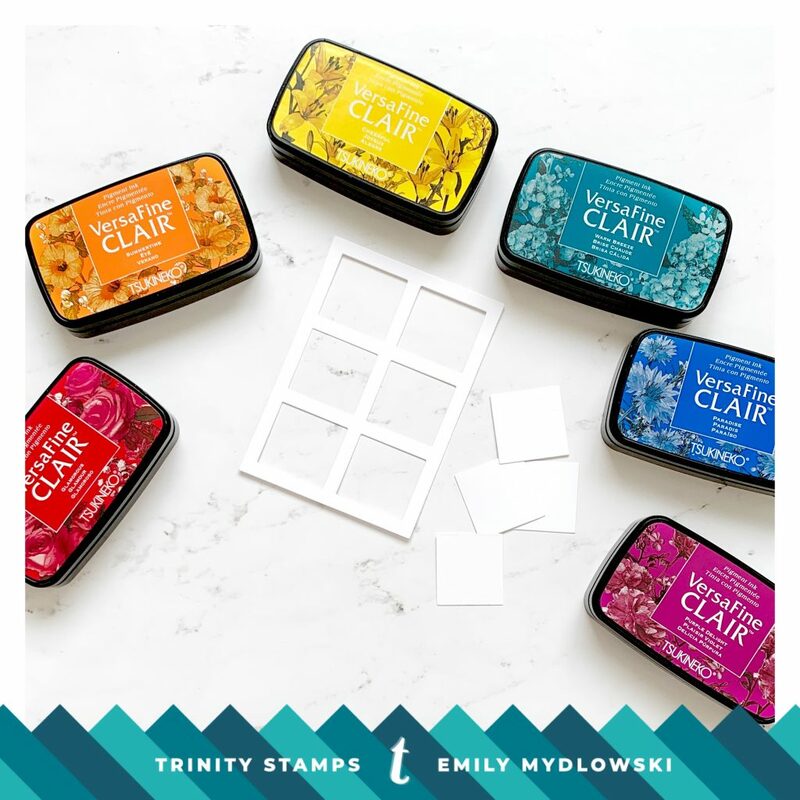 Join us on the Trinity Stamps Facebook Community group, the Trinity Creativity Monthly Challenge and when posting to Instagram use #trinitystamps so we can see your awesome Trinity-Inspired designs! !